I first got to know Poblenou when I was looking to move away from the centre and get closer to the beach. It was during that search that I stumbled across this little gem of a street. 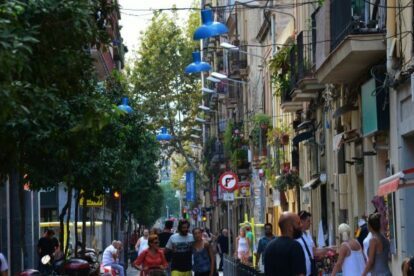 Unlike the better known Rambla Poblenou, carrer Marià Aguilo offers a glimpse into the heart and the soul of a still traditional Barcelona barri or neighborhood. A friend who runs a business here told me that he still hears some of the older residents refer to venturing to the centre of the city as “going to Barcelona”, a journey which only takes 20 minutes! The businesses are all independent, ranging from one of the best fish mongers in town to an organic parfumier, haberdashers and grocers who know their customers by name. I like to come here in the early evenings when it is animated with locals going to the shops and enjoy the sea breeze which blows along it. I like to amble through the shops and in the small maze of streets next to the Mercat del Poblenou covered market just East of it, finally taking a seat on the aesthetically pleasing park chairs dotted along the length of the street and people watch under the spindly orange trees while deciding when to take a drink and rub shoulders with the veins of Poblenou at the small but perfectly formed La Pubilla or Bitacora near the library.